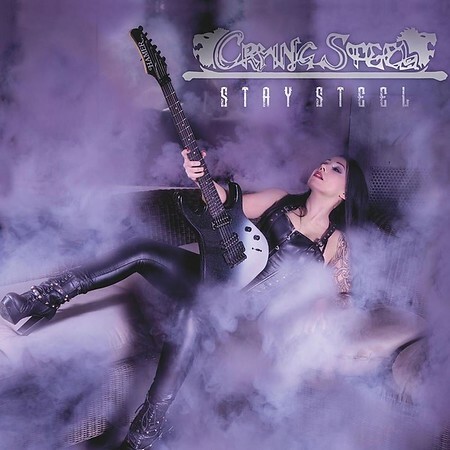 “Stay Steel” is the latest album from Italian metal band Crying Steel, which notably features former Shy / TNT frontman Tony Mills on vocals. The album was released on 15th June by Pride & Joy Music. Crying Steel were active during the 80’s initially before effectively splitting up and then reforming in 2003. This is only their third new album since reforming. I’ll be including the track “Speed of Light” on Friday NI Rocks Show next week. Crying Steel formed in Bologna in 1982 with several members having played in the band Wurdulak. They released a self-titled EP in 1985, followed by their debut album “On The Prowl” in 1987. Those were to be the only releases during the band’s first outing and there were to be quite a few line-up changes throughout that period. The band toured Russia in 1990 before splitting up; only to reform for a brief reunion in 1994. A second reunion in 2003 proved more stable and the band have been performing across Europe since then. The album “The Steel is Back” was released in 2007, followed by “Time Stands Steel” in 2013. The band then released a box set in 2016 that featured a re-issue of the debut album “On The Prowl” along with a DVD of their appearance at the Wacken Festival in 2014. The only founding member of the band that remains is Angelo Franchini on bass, but drummer Luca Ferri and guitarist Franco Nipoti have been with the band since 1983. Guitarist JJ Frati joined the band in 2014. There have been a number of vocalists in the band since 2003 and the most recent was Mirko Bacchilega who joined in 2016. However, it was announced that same year that former Shy / TNT vocalist Tony Mills would feature on the forthcoming album.